Our craftsman harvest and process stone from quarries, mountains, fields and woodlands. 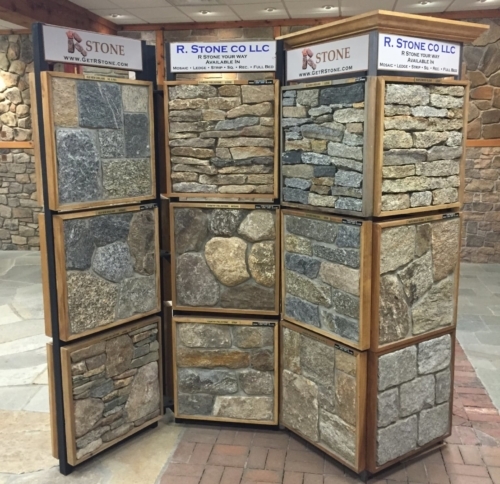 We select only the best New England has to offer – 100% native natural stone. R Stone has everything you need for innovative and unique interior and exterior residential, commercial and landscape applications. Our stone is hand selected for color, the beauty of its natural variations, and superior quality. Whether you’re a homeowner, architect, builder, or contractor, our natural stone products will help you realize your vision to create something remarkable. All display boards at dealer locations have been professionally shaped and trimmed to maintain joint size. Finished applications are at the discretion of the property owner and installing contractor. R Stone produces our product from natural stone. It is provided to you “as is” without warranty of any kind as definite variations in color, texture, and size will occur in all natural stone. Samples, brochures, photos, and digital images may differ from the stone you actually receive. For best results, washing stone before interior installation is recommended. Please blend all material before installation when multiple pallets are being used. Use of chemicals or acid cleaners is not recommended. User accepts all responsibility if a “dry stack” application is performed on any exterior project. Installation using a dry stack method or trimming of stone will require additional material. The quantities of our packaging will take into account a standard installation including a mortar joint. Our Thin Stone line is also available in full bed 4”-6” veneer.